Were you looking for The B-side? It’s here but…revamped. After much consideration, I’ve decide to combine The B-Side into my Think & Grow Chick Accountability Group. With the recent growth of the Accountability Group (as of this post we have over 1,500 members!) and the fact that we post our goals in there as well, I felt like it just made sense to combine the groups. Also, as I’ve continued to do these B-Side post, I’ve realized more and more that my business goals are inter-related with my personal goals. I was starting to feel kinda stifled only reporting on my business goals, so now these “Monthly Goals Reports” will reflect both my personal and business related goals! This last quarter of the year has been ka-ray-zee for me! I know this is the time of year where most people slow down, get introspective, and start prepping for the new year but for me, I was determined to finish Quarter 4 strong. I’m proud to say that “finish strong” is exactly what I did. I still have a month to go but I’m still blown away at how things have been taking off. So much so that with much nervousness and trepidation…I’ve decided to post my very first income report this month. At the beginning of this year, I decided I was tired of playing small with my brand, tired of watching other people succeed while I stayed stuck in the same place, and that 2015 was going to be the year of “now or never.” I had been out of college for 3 years and finally admitted that I could no longer use school as an excuses for why I wasn’t investing the time or money necessary to make Think & Grow Chick a success. Please keep in mind that up until January 2015, I was making exactly $0 with Think & Grow Chick. Actually that’s not entirely true…I was making about $50 every 3 months from Adsense off my old Youtube hair videos. Hardly enough to quit your job on. But quit my job is what I was determined to do so I decided to really go for it. Thus, I’ve been investing in and plugging away at my business all year. Since January 2015, I’ve consistently brought in between $1,000 – $2,000 in monthly income from T&GC. I didn’t post my income reports (and I’m still reluctant to post!) because my T&GC income varies widely, as every month I’m experimenting with launching new products and marketing systems AND I still invest (i.e. put the money I make back) in my business very, very heavily. However, October and November represented a bit of a “tipping point” for me. I re-vamped my website, engaged in some high-profile partnerships and BOOM! It was like my brand took a quantum leap! If you learn nothing else from my experience, know that you should NEVER quit at the end because in this last quarter alone I have experienced more growth than I have all year. My accountability group exploded, email subscriber list exploded (I’m nearing 5 figures) and…I’m nervous but kinda excited (I’m still in surreal mode with all this so bear with me) that my income…took off. I won’t say “exploded” – that would be too much – but I did make more last month than I ever imagined I would, especially this year. I literally had to double check the numbers I was so surprised. Part of the reason I’m even doing an income report is because (1) the whole point of these monthly goals reports is to be transparent with the good and bad concerning me chasing my goals and (2) I personally have been encouraged and inspired by the income reports of Pat Flynn, John Lee Dumas, Regina Anaejionu, Maya Elious, and others. Seeing their numbers literally showed me that it was possible that someone like me could make a real income, on the internet, doing something they love. Furthermore, I’ve been sharing what I’m doing with my family and the change it has made in them literally lights my heart up. Because they see me doing this, they now are inspired to go after their dreams too. Just the other day, I was at my Grandmother’s house for Thanksgiving and she was ecstatic to show me pages and pages of notebooks with her writings. Since my mom told her what I’m doing with my work, my 70-something grandmother has LITERALLY handwritten 3 books, 2 screenplays, and 3 rap songs (dead serious). All because she’s inspired by what’s possible. As I write this post, my 50-something mom is in town, preparing for her very first photoshoot, as she’s now walking in her dream and launching her brand and as relationship coach for women in transition. All because she’s inspired by what’s possible. Note that I’ve already deducted PayPal/Gumroad fees from all sales totals, so the numbers above represent the amount that actually hit my bank account. I’m still weirded out by it, which I shouldn’t be because I worked so hard for it, but it’s still a strange feeling to see what you’ve said you wanted for so long, actually come true. That number right there represents more than TWICE my monthly take-home pay from my job. And speaking of my job, I know the next question may be: “So…are you quitting your job?!? !” Soon! But not yet. All my friends ask me and I joke “Not yet because my husband won’t let me” which is true! He’s like “Good job babe…now do it again 6 months in a row, then you can quit.” But in all seriousness, I still reinvest HEAVILY (like, thousands of dollars a month) back into my business so I do want to get to a point where I’m making the above, on autopilot, consistently. 1. Finish No Excuses Woman Program. Not only did I finish it but I really knocked this one out of the park. :-)(*Pats myself on the back*) This by far is not only my best-selling product, but it is my most well received product. The feedback I’ve gotten is incredible which makes me sooooo happy. I worked really, really hard on this one because as someone who truly used to struggle with self-discipline, I genuinely wanted to help women find freedom in their lives. So I’m very proud of No Excuses Woman. 2. Finalize November collaboration. Yes! 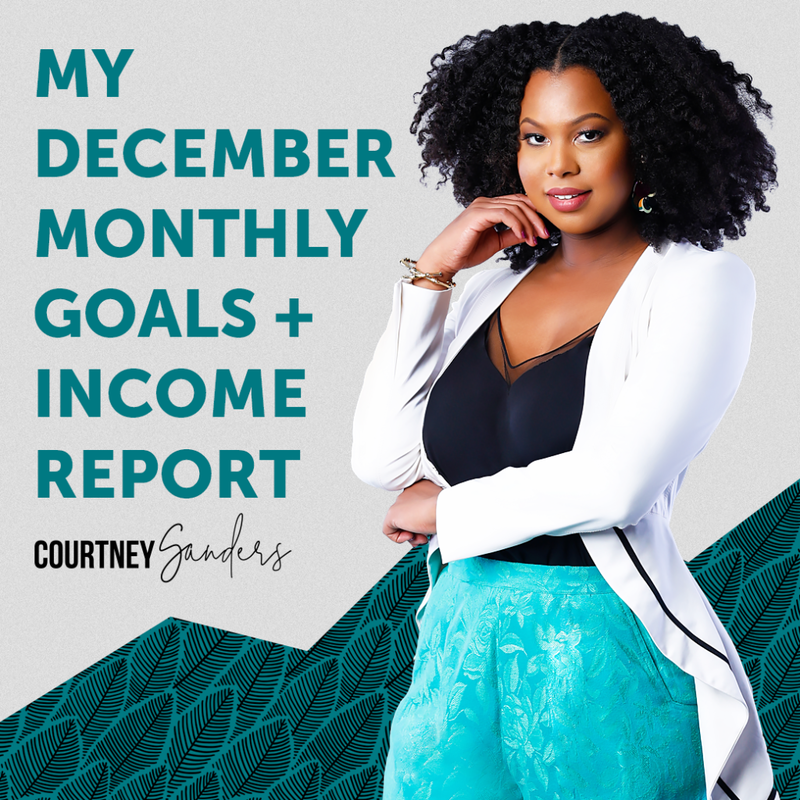 In November, I partnered with Millennial Money Expert Dominique Broadway for a free 7-day money challenge called #GetMyFinancialLife. This was a great success as we have 1,300 women (an some men!) sign-up for the challenge. We’re also hosting an exclusive brunch in DC for the winners this month which I’m very excited about. 3. “Batch” create a bunch of new blog content. Fail. Between No Excuses Woman and the #GetMyFinancialLife challenge I had NO TIME to do anything else. 4. Get fitness and diet back on track. Fail. This is terrible because I’m the first one to say you HAVE to make time for you even when you’re working on your business but I totally dropped the ball in this area. I’ve been super lax in part because it’s the holiday season but that’s still no excuse. Even if I eat terribly, I should still be working out. But after a little introspection (and talking with my new, entrepreneurial AND fit friends – Grit by Brit and Jená Emily Utley) I realized I’m just bored with the gym. Brit has a really cool studio here in Dallas that offers dance classes, so I’m going to join her studio this month to give my workouts a much needed change up. 5. Focus more on my femininity. Last month I explained that while I was holding my own as a “businesswoman” I didn’t feel like a woman in business. In other words, I felt like I was neglecting my self-care and overall focus on my femininity. Last month, I did a really good job taking breaks just to connect with myself as a woman. I also brightened up my space, took some nice hot baths, and spent some time making my womanhood a priority. I will continue this. 2. Outsource an Administrative Team. I’ve been saying and saying I need to do this but it’s time. Like fa’ real. My best friend back home is helping me get organized and get some admin stuff together but I’m ready to budget for a small overseas team. I’ve been reading a lot about how there are excellent Virtual Assistants in the Philippines that I can hire for a low monthly cost so I’m seriously researching that. I’m reading a book right now on outsourcing and working to document my processes so I can bring someone on. 3. Finish My Coaching “Homework.” I’ve been working with a business coach since April who has helped me tremendously with the technical, back-end parts of my business. I still have some outstanding “homework” I need to finish as a result of our working together, so I want to tie up those loose ends and finish the year with those “assignments” in place. 4. Chill Out and Prepare for the New Year! Okay, now I’m officially ready to rest! Outside of the above (which is still a lot, I know) I really want to chill out and just plan for the new year. I already ordered the 2016 Passion Planner, which I’m very excited about, so I’ll be spending this month winding down and filling my new planner out. Working in my business vs. Working ON my business. Right now I’m dealing with the exact issue Michael Gerber describes in his excellent book “The E-Myth Revisited” which is that I spend a lot of time being “the technician” and not as much time as I want being “the business owner.” This is, of course, my fault because I’m a major DIY kinda girl. The only problem is, now that I’ve done everything myself, I have to figure out how to hand off the more administrative tasks in my business to someone else so I can work ON my business, not in it. This is why I’m dead serious about outsourcing a team now. I hemmed and hawed at this for at least 6 months but I’m now at the place that I cannot grow any further unless I have people helping me. The only issue is – now I have to take the time to train and teach someone what I know when I barely have enough time to do it myself as it is. But, putting a team in place is a MUST for me right now so I’ll figure it out. Re-writing my goals everyday. I know I listed this as working for me last month but now that I’ve hit the level of income I did, I had to restate this just to show you how powerful this is. Every day since September, I have literally written down in my notebook: “Goal – to earn at least $7,000/mo for 6+ months in a row via digital product sales and other passive income streams.” I don’t think it’s a coincidence that last month – just 3 months later!!! – I hit at least the first part of that goal! WRITE YOUR GOALS DOWN EVERY DAY! When you see what you want right in front of you, IT MAKES A DIFFERENCE!